3D printing has never been easier than with the reliable, easy-to-use, smart, and award-winning Robo R2 3D printer. Print BIGGER and BETTER 3D prints than ever before with our 8" x 8" x 10" build volume - 25% larger than the average 3D printers in it's class. With a print range from 300-20 micron in layer height, the Robo R2 is best in class in print quality. Print 3D models (.stl format) directly to your 3D printer with our innovative on-board slicing on our 5" color touch screen. You can also store up to 500 3D models with 4gb of storage as well as start/stop/monitor your print jobs all from your R2 touch screen. 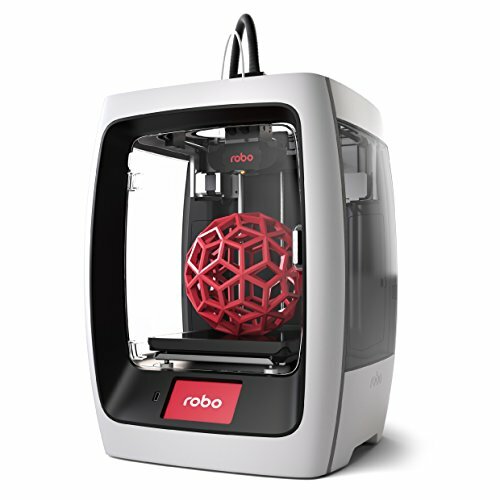 Wi-Fi Connectivity - download the Robo app (iOS available now - Android coming soon), connect your Robo R2, and print directly to your 3D printer with your phone or tablet. Save all your models in your google drive or dropbox, access them within the app, and send the models to your Robo R2 while enjoying features like automatic leveling on our removable, heated, buildtak platform. Open source filament system means you can use the Robo R2 to print with 30+ materials from a variety of vendors - and with filament run-out detection, your print jobs will never fail due to material running out. The Robo R2 will automatically notify you, save your 3D print, and resume when you're ready with a fresh roll. 3D Print two different materials, two different colors, or use water soluble support material on the Robo R2 with our dual extruder upgrade kit (coming soon).